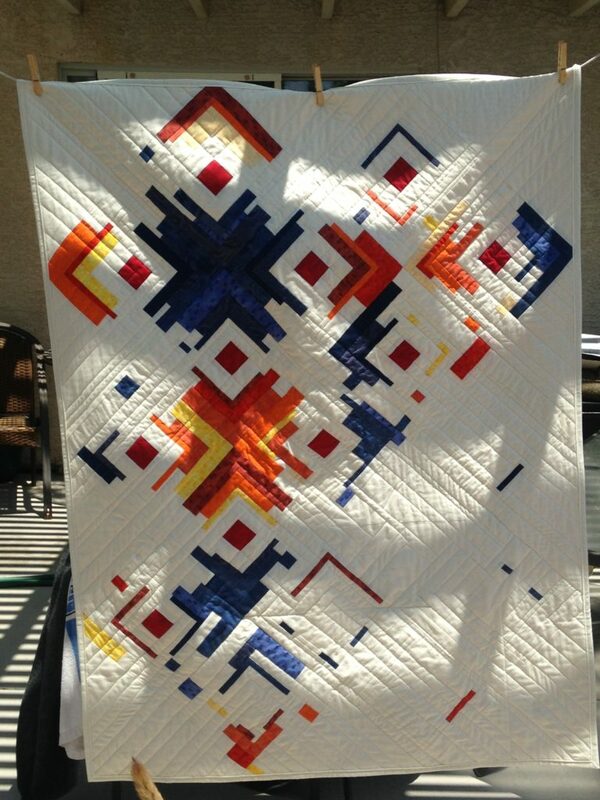 I had seen a modern quilt on Pinterest that I just loved! I thought I had saved the pin, but it doesn’t seem to be there. Wasn’t a pattern, just an image so when I do find it, I will put the credits here. But… I thought, “Hey! 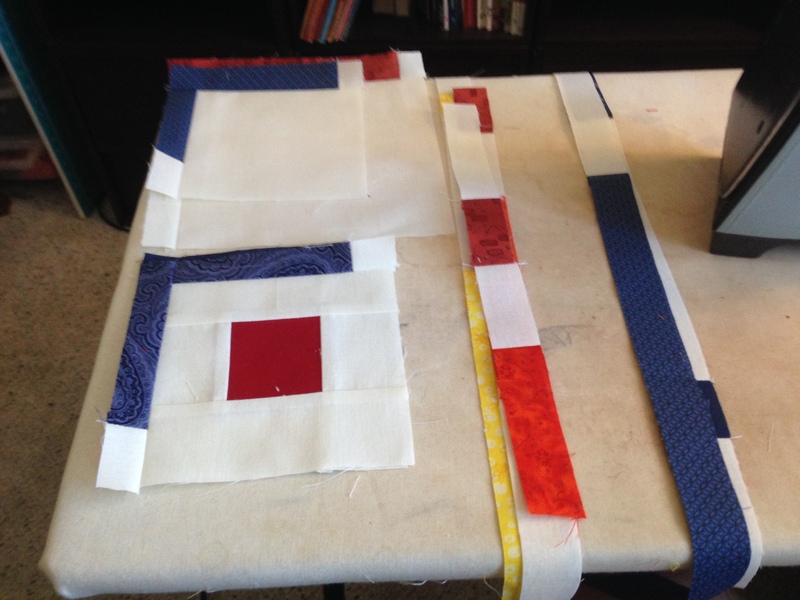 I have all these scraps left over from making Kara’s quilt, I should make something from them like this!” It’s a very basic construction using a log cabin block technique. So I gathered up that basket of scraps and went to work. EDIT: Finally found the quilt artist I got my inspiration from! Her name is Pasqualina. She was on Instagram, not Pinterest like I thought. No wonder I couldn’t find it when I was desperately trying to find it again. LOL Here is her instagram https://www.instagram.com/ergo_ago_pasqualina/ I LOVE her work. 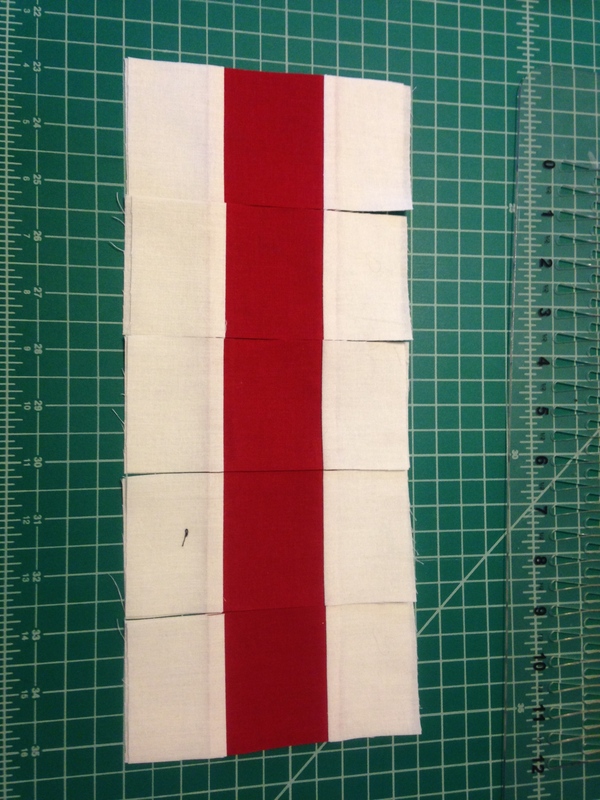 I cut strips of white and a red fabric in 2-1/2″ strips and sewed together. 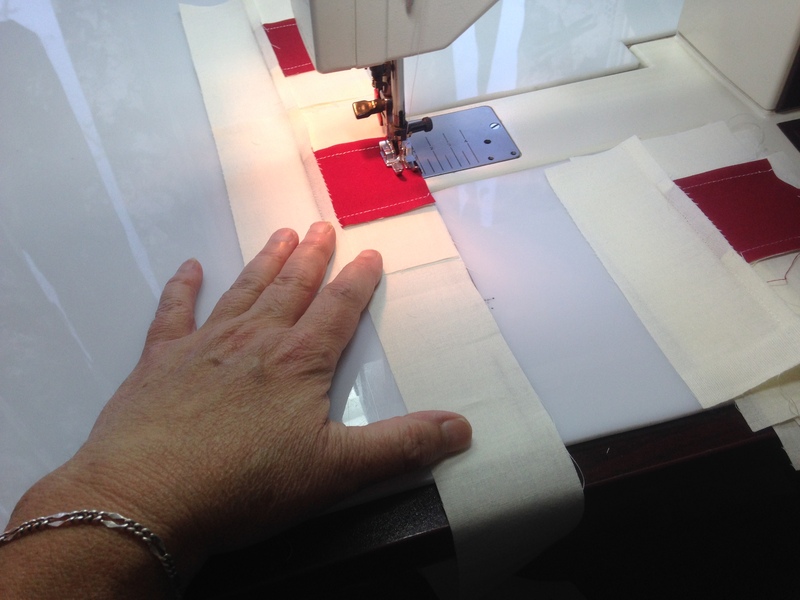 Then using one of my fab cutting templates, my Quarter Cut by June Tailor, I cut the strips into 2-1/2″ sets. 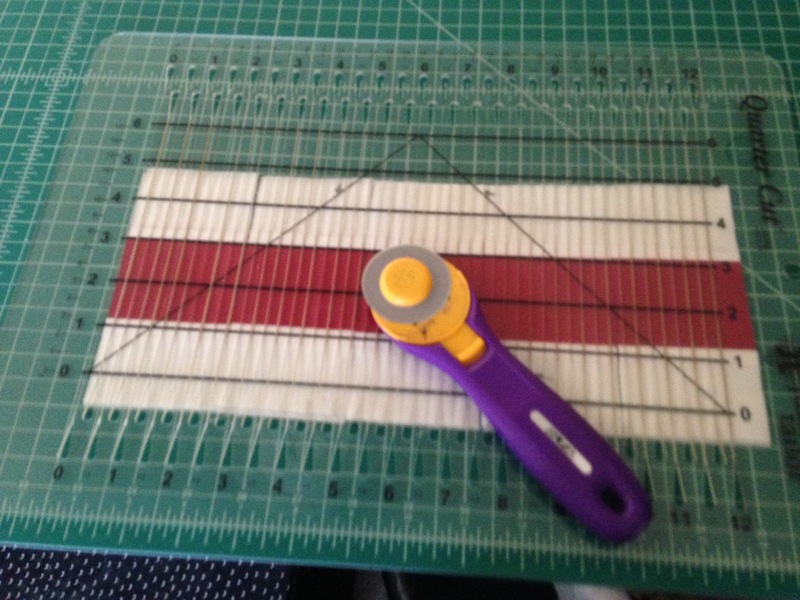 This tool makes cutting so fast and easy! I use it a lot. 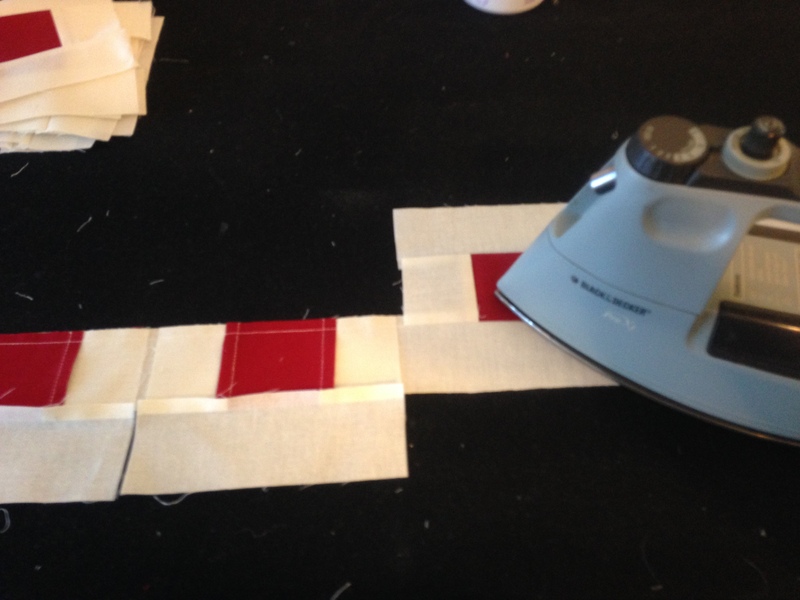 Chain piecing those cut strips onto another long 2-1/2″ cut strip of background fabric all at once. Cut sets apart, iron seams open. 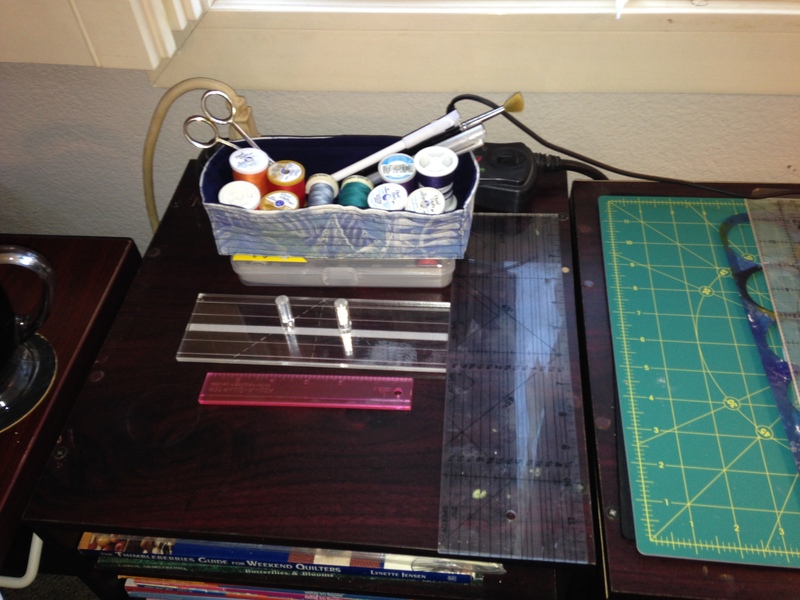 Then taking the previous sets and chain pieced again onto another 2-1/2″ wide background strip onto opposite side. 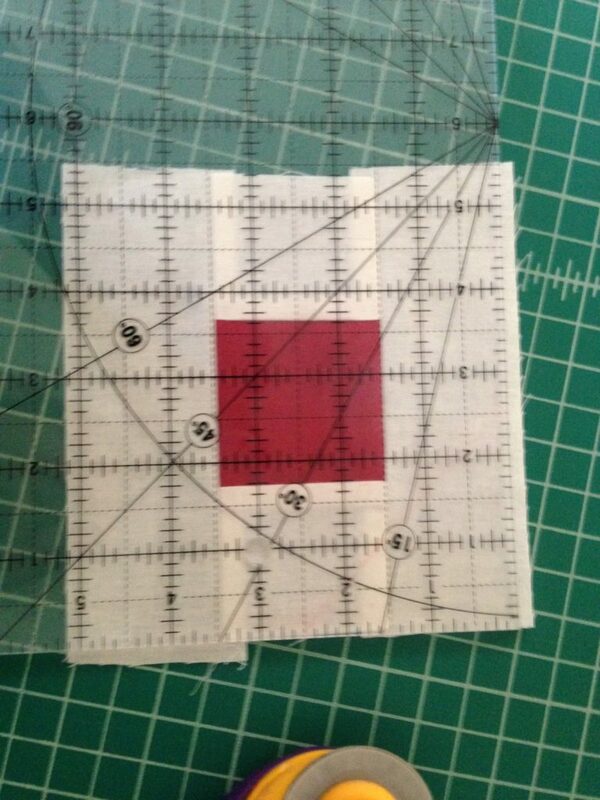 This makes for very fast piecing and I use this chain piecing technique whenever I can. Iron open the squares while still in a chain. 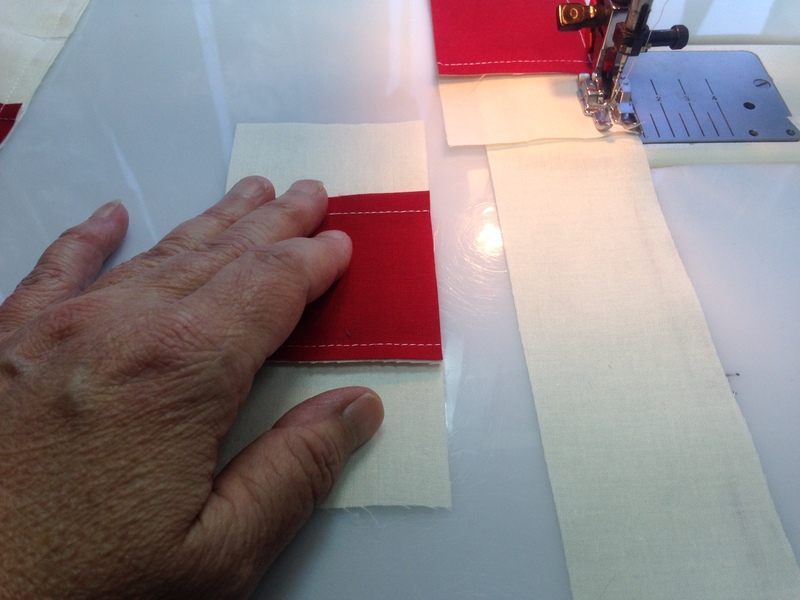 Another speed tip I’ve learned over the years of quilting. 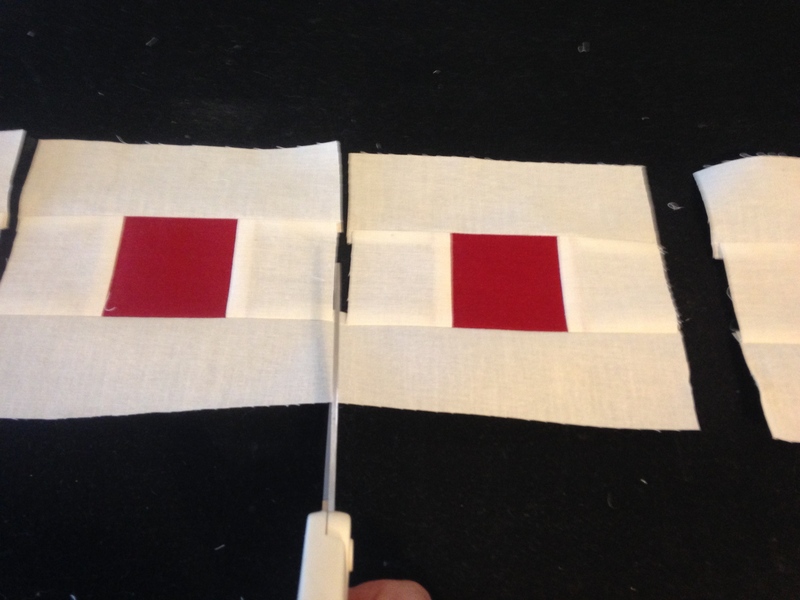 Then I cut various widths of the white background fabric from 1″ to 2-1/2″ and inserted same size color strips. 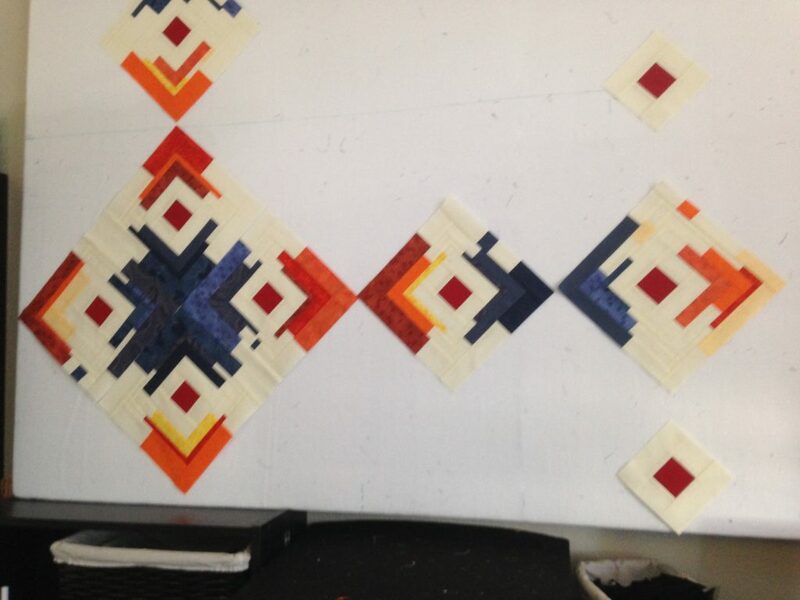 I used these to continue to make my log cabin blocks being mindful of color placements. When you have a ton of scraps, it’s easy to do this. Some of them I actually sewed into long strips first and then sliced the widths. Even faster! I first placed the red centered squares on my Design Wall. Then I took each one and added the strips to get to this point. The I used various sizes of white squares and added the “logs” around them so that I got a shattered color effect moving outwards towards the edge of the quilt. Took a little thought, but with having a design wall it was easy to see what colors I wanted to add where. 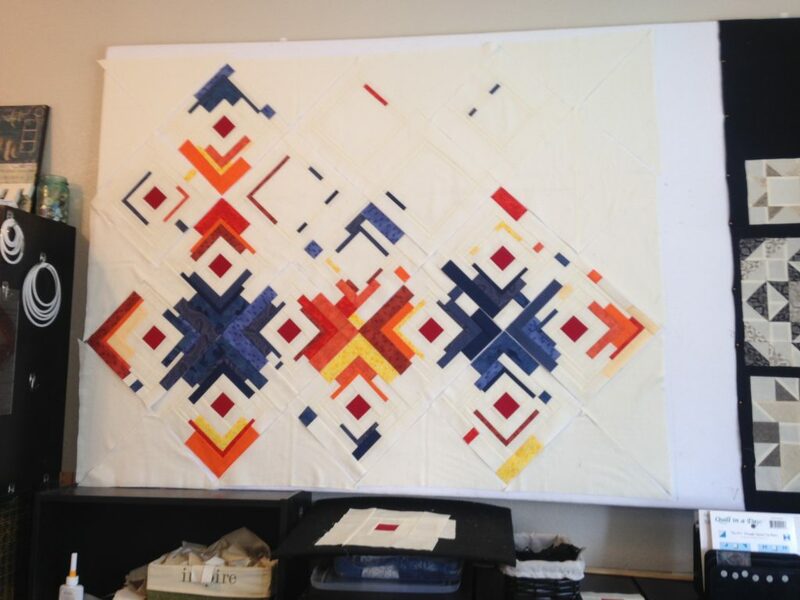 Added batting and backing, quilted in straight lines moving outward from the main center design. Added the binding and DONE! 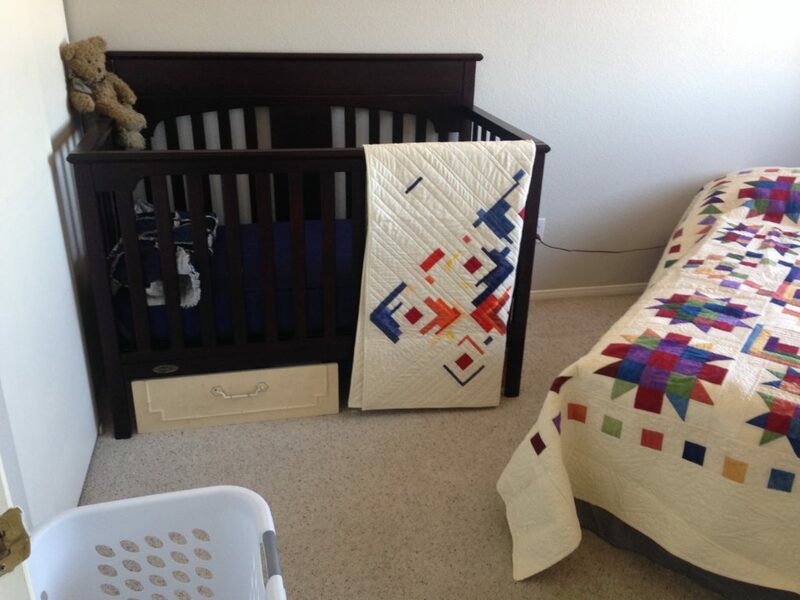 Took me a few days, but this was really a fast way to make this quilt and using no pattern! Time to Plant Edible Greens and Garlic too of course! Retiring Digi Art Classes on Sale 50% off! Categories Select Category Art Quilting Classes Digital Art Digital Scrapbooking Fabric Dyeing Finish it Friday Gardening In the Art Studio Just Life Mixed Media Modern-Improv Quilting Repurpose Refurbish Scrap Stash Projects Sewing and Quilting Sewing Studio Sustainable Living Tips for Sewing-Quilting Traditional Quilting Uncategorized W.I.P. Welcome! This is a great section to talk a little bit about who you are!